The ILSI Europe Emerging Issues Process was an initiative launched for the first time in 2015, whereby all interested parties were given the opportunity to engage more directly with ILSI Europe by suggesting strategic scientific issues for the future. These emerging scientific topics, relevant to a wide range of stakeholders, could then be proactively tackled by ILSI Europe. 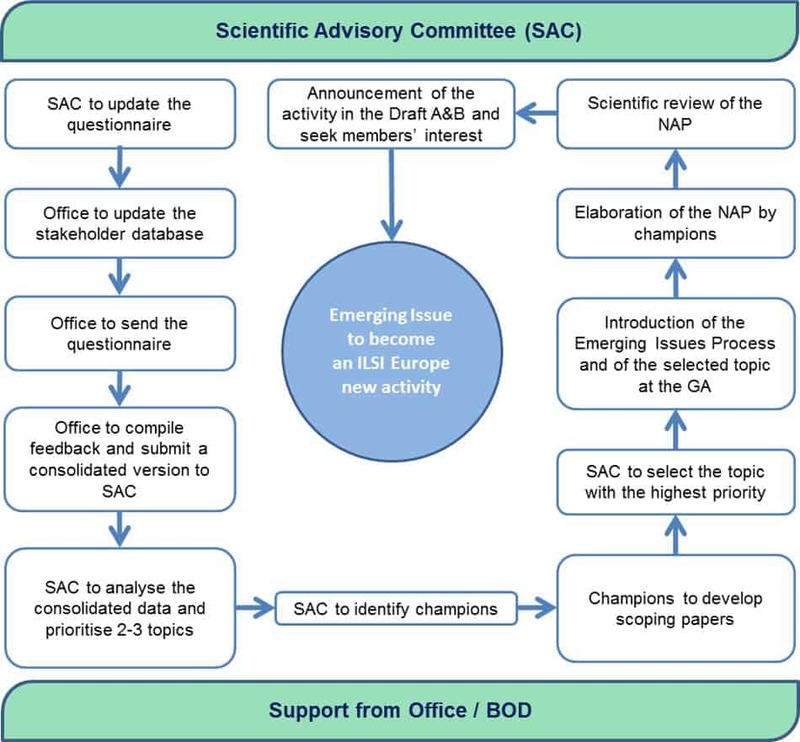 To set the wheels in motion, in June 2015, the Board of Directors (BOD) invited the Scientific Advisory Committee (SAC) to develop a questionnaire. ILSI Europe’s office then surveyed more than 1100 stakeholders who are / were all involved in our activities or represent national or international organisations, including experts from industry, academia and the public sector. Among the suggested topics, three were prioritised by the former Emerging Issues Committee (EIC), composed of members from the BOD and the SAC: ‘Consumer Behaviour Determinants’, ‘Food Waste’, and ‘Big Data Analysis’. Volunteering champions elaborated on these topics and prepared ‘scoping papers’. Based on this information, EIC members then ranked the three selected topics. ‘Consumer Behaviour Determinants’ was assigned first priority. The topic on ‘Consumer Behaviour Determinants’ was then further developed by Prof. Lynn Frewer (University of Newcastle, UK), Prof. Klaus Grunert (University of Aarhus, DK) and Prof. Wim Verbeke (University of Ghent, BE) into a New Activity Proposal (NAP). This NAP was approved by the BOD and focused on ‘Nudging and Sustainable Changes Towards Healthier Food Choices’. The purpose of this first activity will be to review the literature on nudging when applied to food choices, and to provide conclusions on what is known and not known on nudging effects. In particular, the evidence on if and when nudging can lead to long-term behavioural changes will be assessed. A new expert group was created and kicked-off in December 2016. It was funded by seed money in 2016 and through the voluntary support scheme as indicated in the Financial Agreement Form sent to all member companies. The topic on ‘Food Waste’ was ranked second in the Emerging Issues Process and attracted high interest from several member companies. ILSI Europe proactively initiated discussions with experts from the EU-funded projects we are involved in. Additional experts from well-known relevant organisations also joined forces with ILSI Europe to elaborate on sustainability-related research gaps. The purpose of a new activity on food waste could be to gain insight into the causal pathways leading to consumer food waste. It would ultimately help us to develop evidence-based intervention strategies to effectively address the challenge of food waste. In March 2017, the Emerging Issues Process will be re-launched. Strengthened by the experience gained from the first round, a new survey will be shared with an updated and even more comprehensive list of key international stakeholders. ILSI Europe’s Vice-President will supervise this year’s process.